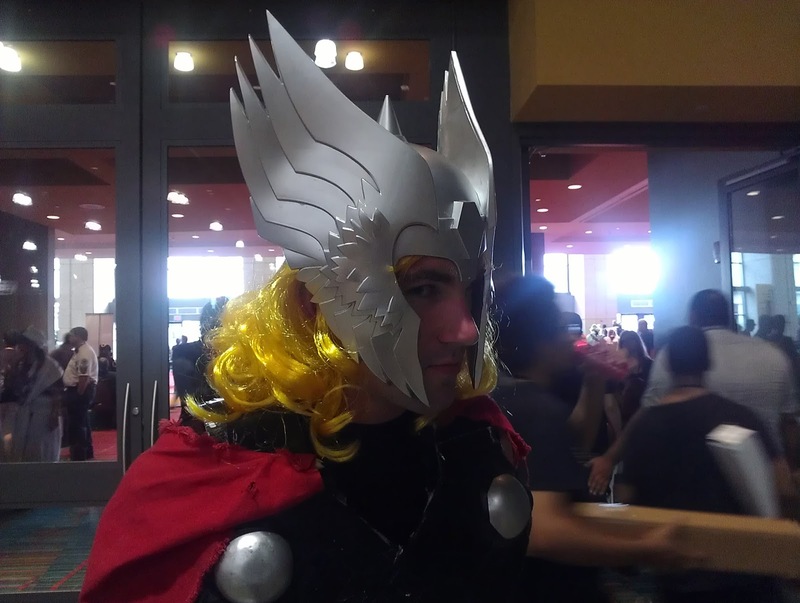 Now that's what I call a Thor helmet! One of my favorite conventions to attend is ConnectiCon in the capital city of Hartford for a number of reasons - it is close to where I live, located right off the highway, and has convenient garage parking which is not outrageously priced. Also, the physical layout of the building makes it easy to get around, with handy escalators for its three levels of geeky fun and water coolers around every corner. The event has grown into its tagline of "A Massively Multi-Genre Convention" since 2005 when it first opened its doors in the then-newly completed Connecticut Convention Center. The souvenir program book IS a book, with its hefty binding holding 120 pages packed with guests, activities, and panels. And as always, the tabletop gaming scene is impressive in its diversity and scope, a core staple of the con since its early years. As you can see from the photo reel of the con goers and guests, there was everything from Attack on Titan cosplayers to Jay and Silent Bob Strike Back. What used to be a slightly more diverse anime convention has truly evolved into an event for the individual geek in everyone. My only regret? Only having gone for Saturday! 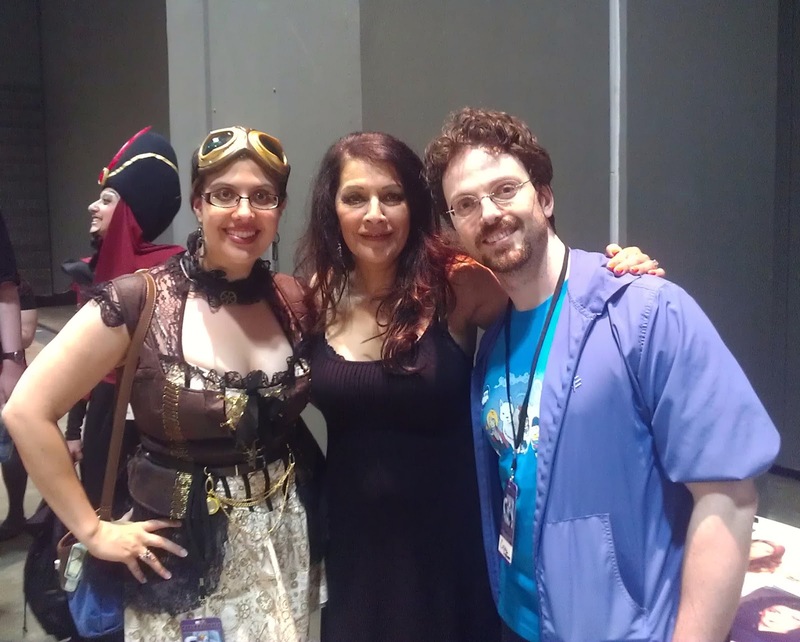 The Critic, Casey, and Marina Sirtis! One of the real highlights for me and my companion, Casey, was meeting Marina Sirtis, a classically trained British actress who is best known for her role as Counselor Deanna Troi on Star Trek: The Next Generation. Smart, funny, and outspoken, her Q&A panel played like a stand-up comedy about the highs and lows of TV and movie stardom. One of my favorite episodes of Next Generation is called "The Child" where a formless being from another distant galaxy decides it wants to experience what it is like to be human and chooses Counselor Troi to be its mother. Sirtis's role was so sincere I was surprised when she mentioned she had no children. I asked her what the experience of making that episode was. It was interesting to me that she had to pause before giving her answer - obviously it was not one of the "standard" questions she usually got. After a moment, she gave a very funny story about how all the men on the set - including Patrick Stewart - were unusually kind to her when she had to wear her fake pregnant belly while shooting, giving up their seats for her as they would to someone who really was pregnant! Then she said that when she was holding the tiny baby, covered in mayo and raspberry jam to look like a newborn, she had that sensation of love and bonding, as if it really were a child of her own that she had given birth to. She also said that particular episode has special significance for her - there had been talk of cutting her character after the first season, and of course she was very worried about the future of her TV career. When she was told that the first episode of the second season would be a Counselor Troi episode, THAT particular episode, her relief was tremendous. Check out my video of Marina Sirtis's panel here! Another great panel was with Jim Cummings, who has pretty much done every voice of every Disney character ever. Okay, I exaggerate, but he's done a lot, such as Winnie the Pooh, Tigger, and Darkwing Duck. 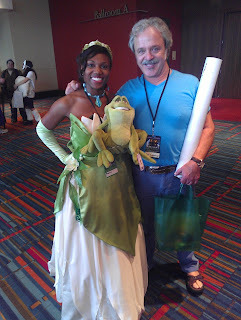 It was a real pleasure to get to hear his take on the last scene Gone With the Wind with Rhett Butler having the voice of the Louisiana cajun firefly, Raymond, from Disney's Princess and the Frog, with fellow voice actress Lauren Landa (known for her work as the English voice of Kyoko Sakura in the anime series Puella Magi Madoka Magica) as Scarlett. Talking to him afterwards, Casey and I found out he actually lived in New Orleans in his youth and helped design Mardi Gras floats. Casey, who was born and raised in New Orleans, got to have a brief chat about what Mr. Cummings calls "the good eats" down in the Big Easy. My only issue was that the panel room was TINY for someone of his fame - it definitely should have been held in the ballroom area where Marina Sirtis's Q&A took place. The panel that wrapped up the day for me was presented by my colleague and friend Charles Dunbar and his companion Aleks Prince with Are You Scared? A Look at International Horror Films. As someone who has cautiously made her way into the horror genre, having had a low tolerance for blood and gore as a youngster, I came to the panel hoping to get some good ideas for films to watch that I might not have heard of. 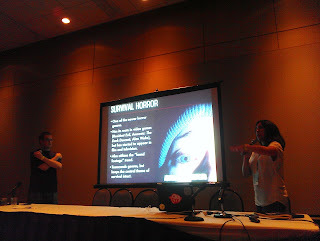 The panel used its 1.5 hour slot well by delving into the subgenres of horror as well as how different countries around the world put their own spin on what goes bump in the night; including clips from each discussed feature. One French film discussed that I'm particularly interested in seeing is Peur(s) du Noir (Fears of the Dark), an animated feature created in 2007 that is a series of short stories that revolve around one central theme - greatest phobias coming to life. The co-presenters had a good balance with one another that allowed each to give their individual perspective without overloading the audience with information. The short clips also gave me a good sense of what films to personally avoid - for example, the three minutes I saw of Susperia, an Italian film made in 1977, was just way too gruesome for the likes of me. But much like the con itself, whether it was gore, suspense, psychological or just downright weird, everyone left with something new to watch and think about. 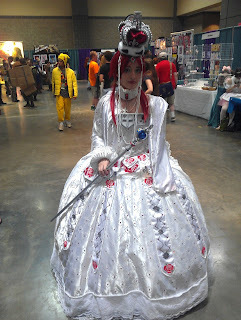 Best cosplay on Saturday - entirely handmade! As shown in the photo reel above, there were also some incredible costumes - this woman shown on the right cosplaying as Esther Blanchett from the anime series Trinity Blood handmade every part of her costume over the course of a year and a half, right down to the hand-painted roses on her dress! Talk about dedication. All in all, the day and the con exceeded expectations and left me wanting to stay for more.It is gratifying to me how it has evolved over the past several years due to the dedication and hard work of fans and volunteers. I look forward to what the con will have in store for 2014, and this time, I'll stay for the whole weekend!